I'd wanted to go on a Piedmont Park Historic Tour for years. I finally made it! Having once wanted to be an archaeologist, I've always found history fascinating...and I'm curious by nature. I'm not sure when they installed the park 'features menu' pylons (Evidently, I'm not sure what they're officially called either. ), but they're a fantastic feature within the park...a great way to orient yourself when visiting and there's one at every major entrance. Look for them! Now, a little history... Most Atlantans know about the 1895 Cotton States and International Exposition, but just how much do we really know about it? Many are surprised to learn that it lasted 100 days, was built for 6,000 exhibits, and received 800,000 visitors (from 37 states and countries)...and that was when the local population was only 75,000! You'll learn the important role of railroads, relative to the Exposition, on the tour! 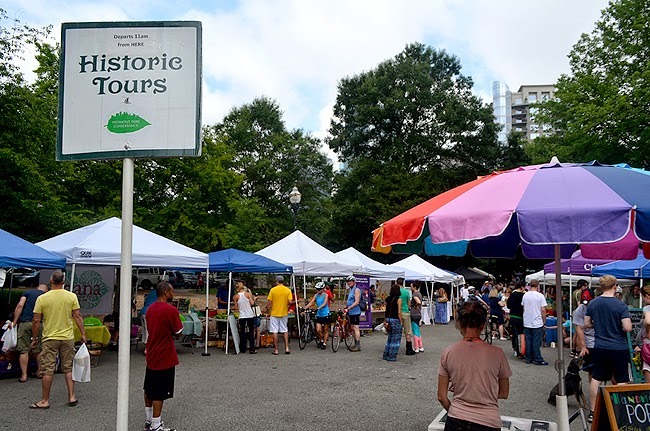 The Piedmont Park Historic Tours begin in Green Market, the park's Saturday morning farmers market, where, for a number of years now, I've shopped and taken in a chef demo from time to time. Don't even think about letting the summer heat keep you away from Green Market...just treat yourself to a King of Pops pop to cool down! My favorite is Chocolate Sea Salt. They're easy to find, just look for the rainbow umbrella. The first stop on the tour is the Visitor's Center, known as "Dockside". 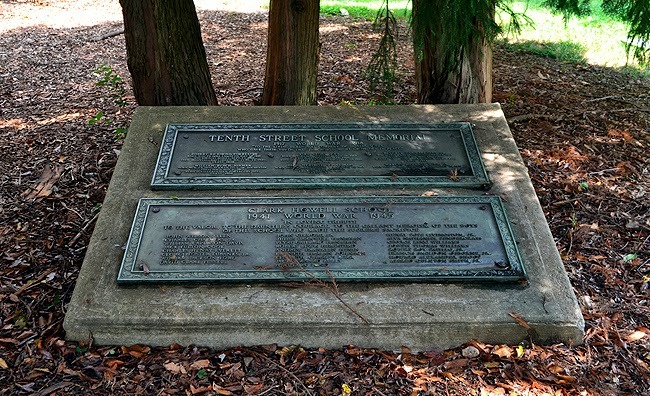 The building, which faces Green Market at the 12th Street entrance to the park, is the oldest continually standing structure in the park. You'll learn cool factoids like that throughout the tour! The dock, where there was a fitness class taking place the morning I went on the tour, is a destination for a lot of park goers, as well as the site of many wedding ceremonies...it's a beautiful setting! You'll learn more about Lake Clara Meer on the tour! Now, my followers know that I'm an avid explorer. So you can imagine my surprise when it dawned on me during the tour that there's so much of Piedmont Park that I've yet to explore. I've seen a LOT of it, but there's so much more to discover! It turns out that the above pictured playground is the only one of its kind in the United States! It's from a 1976 project...but you'll learn more about that on the tour! The tour doesn't take you through the entire park, so if you've been worrying that it'd be too much walking, not to worry. There is of course walking involved, but not as much as you might think. But I did have a coffee at Green Market and was sure to wear comfortable shoes. Let me fast-forward to the present, just for a moment. Piedmont Park Conservancy is, in my humble opinion, demonstrating its mission quite wonderfully. 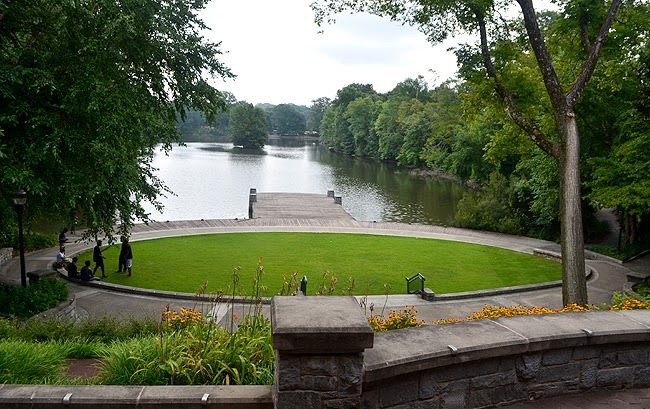 To enhance and preserve Piedmont Park as a vital urban green space and as a cultural and recreational resource that enriches the quality of life for Atlantans. 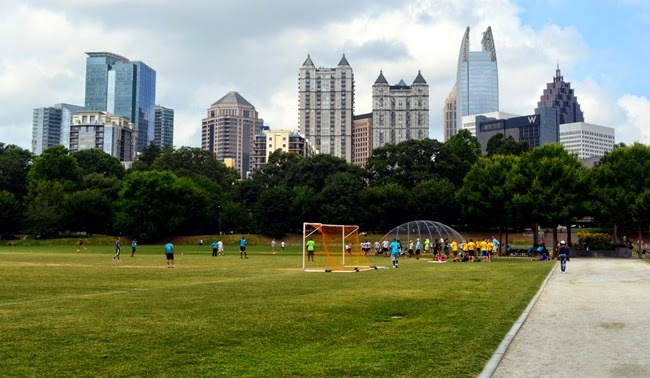 Piedmont Park is home to numerous festivals, concerts, soccer, volleyball, fitness programs, jogging, two fantastic dog walk parks, Green Market, environmental learning programs for kids, a fantastic swimming pool and so much more! Now, back to the past... The Active Oval—where you'll often see soccer, volleyball and/or softball games taking place—was originally a driving track for the businessmen property owners, to drive and race their buggies. Remember, this was long before the popularization of the automobile. Again, you'll learn more on the tour! 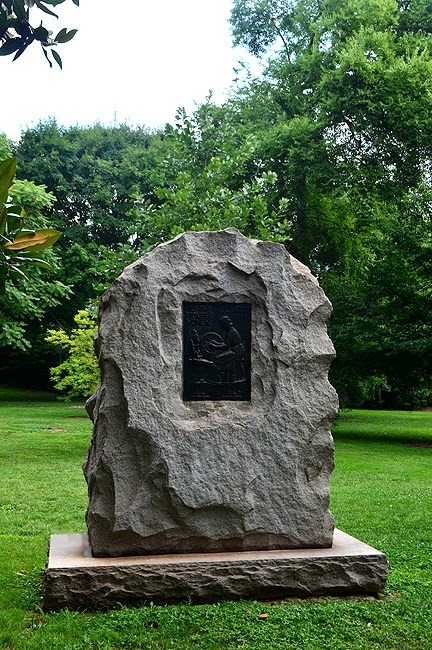 There are more monuments and memorials in Piedmont Park than I ever realized. The one pictured above is marked "To the Atlanta Pioneer Women | 1847 - 1869". Given how short our memories are, I find myself grateful for such memorials. I mean, just imagine the excitement, as well as the hardship, of settling a new land. The above memorial, presented from two different area schools, is dedicated to soldiers who sacrificed their lives in World War I (upper plaque) and World War II (lower plaque). I know, from personal experience, that when you visit Piedmont Park, it's usually for a specific reason—a festival, a game, to walk the dog—and it's not always easy to get away to explore other parts of the park. That's all the more reason to go on one of the Piedmont Park Historic Tours! To our great fortune, there were those who realized that if Atlanta was to thrive after the U.S. Civil War, we would have embrace our Northern friends, we would have to unify as a country. There are those, even today, who think "the South will rise again", but I believe it rose again all those years ago through leadership of those brave souls who helped Atlanta, and the South, adjust to its future role in the United States of America. 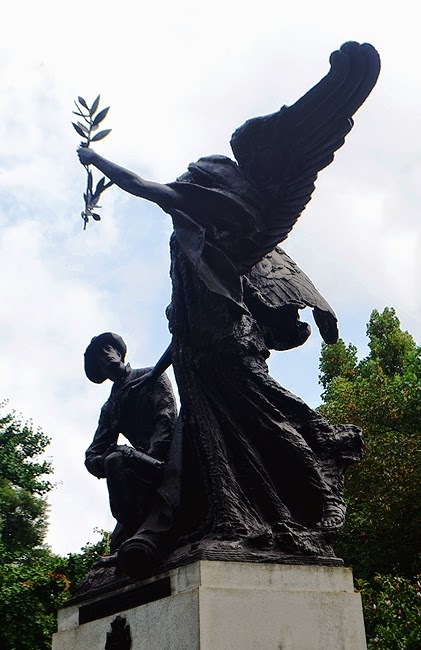 The Gate City Guard statue, pictured above, on the Piedmont Park lawn on the Piedmont Avenue side is a can't miss. Not only because it's so massive, but also for what it represents, which you'll learn about on the tour. Our tour guide Patrick, nine years with the Piedmont Park Conservancy, was fantastic. It was a toasty day but he kept his composure, his enthusiasm, and his humor. And during the fantastic tour, he showed us some photographs of the park that I'd never seen before...they were pretty awesome! That's Patrick, pictured above, on an observation deck overlooking Lake Clara Meer, a vantage spot that's a favorite of park visitors—my current wanderlust ATLANTA business cards actually feature a nighttime shot of the lake and Midtown skyline from that spot! 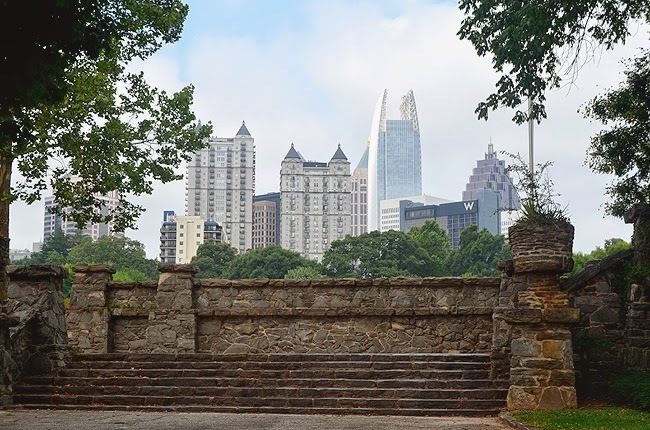 Believe me when I tell you that what I've shared here is merely the tip of the iceberg of what you'll learn on the free Piedmont Park History Tour. 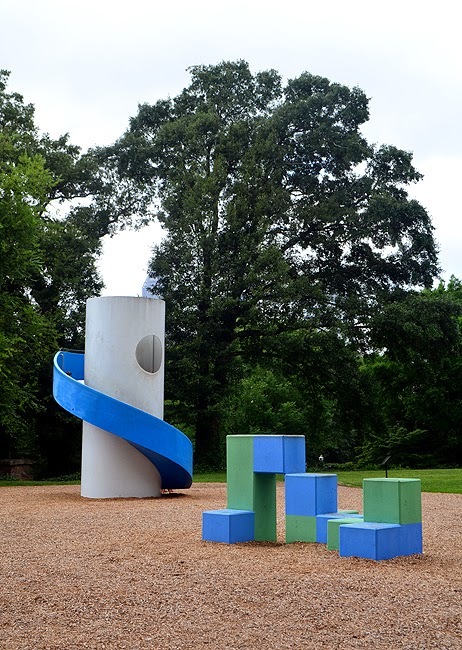 Go with questions, go prepared to learn a rich and fascinating history of Atlanta's favorite green space to play in. Back over between Greystone and the Active Oval... 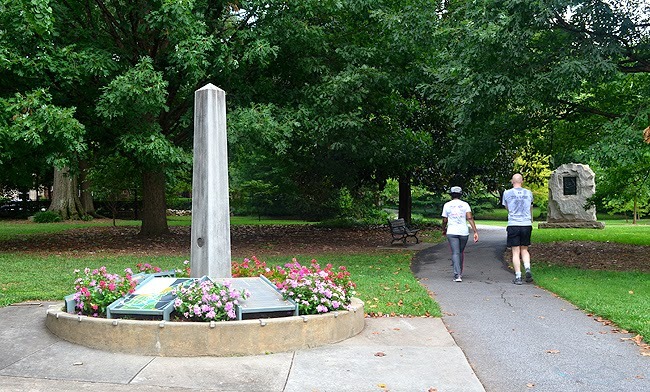 I find it interesting that what could be considered the "center" of Piedmont Park holds a significant piece of history. The above photo is merely a section of what is the largest single remnant of the 1895 Cotton States and International Exposition. And it's remarkable...to think that we get to everyday walk the same steps and pathways once walked by Buffalo Bill Cody, Margaret Mitchell, Hank Aaron, and a host of thought leaders, game changers, history makers...and millions of grandparents, parents, and the children who will shape the Atlanta of tomorrow. 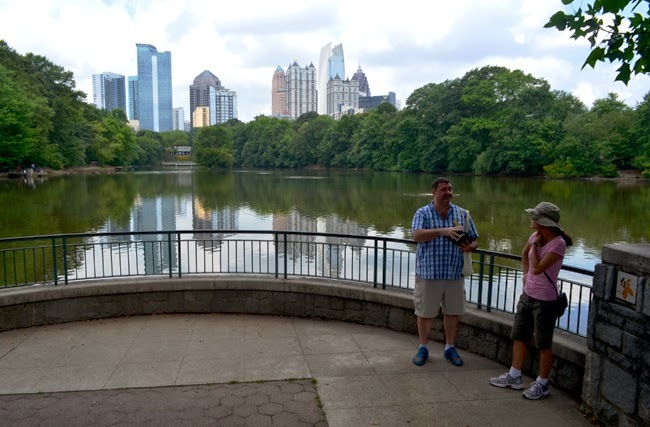 Learn more about Atlanta's favorite green space on a Piedmont Park Historic Tour! Ice Cream...And So Much More! Sally Smith is "Margaret Mitchell"